Medieval Islamic geography was based on Hellenistic geography and reached its apex with Muhammad al-Idrisi in the 12th century. After its beginnings in the 8th century based on Hellenistic geography, Islamic geography was patronized by the Abbasid caliphs of Baghdad. Various Islamic scholars contributed to its development, and the most notable include Al-Khwārizmī, Abū Zayd al-Balkhī (founder of the "Balkhi school"), and Abu Rayhan Biruni. Islamic cartographers inherited Ptolemy's Almagest and Geography in the 9th century. These works stimulated an interest in geography (particularly gazetteers) but were not slavishly followed. Instead, Arabian and Persian cartography followed Al-Khwārizmī in adopting a rectangular projection, shifting Ptolemy's Prime Meridian several degrees eastward, and modifying many of Ptolemy's geographical coordinates. Having received Greek writings directly and without Latin intermediation, Arabian and Persian geographers made no use of European-style T-O maps. In the 11th century, the Karakhanid Turkic scholar Mahmud al-Kashgari was the first to draw a unique Islamic world map,  where he illuminated the cities and places of the Turkic peoples of Central and Inner Asia. He showed the lake Issyk-Kul (in nowadays Kyrgyzstan) as the center of the world. The earliest reference to a compass in the Muslim world occurs in a Persian talebook from 1232, where a compass is used for navigation during a trip in the Red Sea or the Persian Gulf. The fish-shaped iron leaf described indicates that this early Chinese design has spread outside of China. The earliest Arabic reference to a compass, in the form of magnetic needle in a bowl of water, comes from a work by Baylak al-Qibjāqī, written in 1282 while in Cairo. Al-Qibjāqī described a needle-and-bowl compass used for navigation on a voyage he took from Syria to Alexandria in 1242. Since the author describes having witnessed the use of a compass on a ship trip some forty years earlier, some scholars are inclined to antedate its first appearance in the Arab world accordingly. Al-Qibjāqī also reports that sailors in the Indian Ocean used iron fish instead of needles. Late in the 13th century, the Yemeni Sultan and astronomer al-Malik al-Ashraf described the use of the compass as a "Qibla indicator" to find the direction to Mecca. In a treatise about astrolabes and sundials, al-Ashraf includes several paragraphs on the construction of a compass bowl (ṭāsa). He then uses the compass to determine the north point, the meridian (khaṭṭ niṣf al-nahār), and the Qibla. This is the first mention of a compass in a medieval Islamic scientific text and its earliest known use as a Qibla indicator, although al-Ashraf did not claim to be the first to use it for this purpose. In 1300, an Arabic treatise written by the Egyptian astronomer and muezzin Ibn Simʿūn describes a dry compass used for determining qibla. Like Peregrinus' compass, however, Ibn Simʿūn's compass did not feature a compass card. In the 14th century, the Syrian astronomer and timekeeper Ibn al-Shatir (1304–1375) invented a timekeeping device incorporating both a universal sundial and a magnetic compass. He invented it for the purpose of finding the times of prayers. Arab navigators also introduced the 32-point compass rose during this time. In 1399, an Egyptian reports two different kinds of magnetic compass. One instrument is a “fish” made of willow wood or pumpkin, into which a magnetic needle is inserted and sealed with tar or wax to prevent the penetration of water. The other instrument is a dry compass. 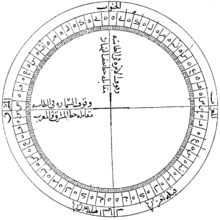 In the 15th century, the description given by Ibn Majid while aligning the compass with the pole star indicates that he was aware of magnetic declination. An explicit value for the declination is given by ʿIzz al-Dīn al-Wafāʾī (fl. 1450s in Cairo). Pre modern Arabic sources refer to the compass using the term ṭāsa (lit. "bowl") for the floating compass, or ālat al-qiblah ("qibla instrument") for a device used for orienting towards Mecca. Friedrich Hirth suggested that Arab and Persian traders, who learned about the polarity of the magnetic needle from the Chinese, applied the compass for navigation before the Chinese did. However, Needham described this theory as "erroneous" and "it originates because of a mistraslation" of the term chia-ling found in Zhu Yu's book Pingchow Table Talks. ^ a b Edson & Savage-Smith 2004, pp. 61–63. ^ Hermann A. Die älteste türkische Weltkarte (1076 η. Ch.) // Imago Mundi: Jahrbuch der Alten Kartographie. — Berlin, 1935. — Bd.l. — S. 21—28. ^ a b c Schmidl, Petra G. (2014-05-08). "Compass". In Ibrahim Kalin. The Oxford Encyclopedia of Philosophy, Science, and Technology in Islam. Oxford University Press. pp. 144–6. ISBN 978-0-19-981257-8. ^ Needham p. 12-13 "...that the floating fish-shaped iron leaf spread outside China as a technique, we know from the description of Muhammad al' Awfi just two hundred years later"
^ a b "Early Arabic Sources on the Magnetic Compass" (PDF). Lancaster.ac.uk. Retrieved 2016-08-02. ^ Tibbetts, G. R. (1973). "Comparisons between Arab and Chinese Navigational Techniques". Bulletin of the School of Oriental and African Studies. 36 (1): 97–108 [105–6]. doi:10.1017/s0041977x00098013. ^ Hirth, Friedrich (1908). Ancient history of China to the end of the Chóu dynasty,. New York, The Columbia university press. p. 134. ^ Needham, Joseph (1962). Science and Civilisation in China: Volume 4, Physics and Physical Technology, Part 1, Physics. Cambridge University Press. pp. 279–80. ISBN 978-0-521-05802-5. Edson, Evelyn; Savage-Smith, Emilie (2004). Savage-Smith, Emilie, ed. Medieval Views of the Cosmos. Oxford: Bodleian Library. ISBN 978-1-85124-184-2.